Well, there’s actually nothing new about it, but it is a wonderful community of book lovers that make videos dedicated to reading and literature. And if you haven’t explored that community, you’re really missing out! Everyone is so friendly and welcoming. The vlogs they make are quite similar to blog posts – book reviews, book hauls, monthly wrap ups, TBRs, memes (or tags), discussions, and a plethora of other topics to make any book worm happy. Andi tweeted about a particularly talented booktuber yesterday. Priscilla from The Readables makes some really high quality, well-edited videos. But there are tons and tons of other worthy vloggers out there, and I thought I’d take a moment to recommend a few I’ve been watching this past year. I think the first thing you’ve got to know is that a large portion of booktube is populated by YA readers and younger readers in general. The average age is probably around 21-23. Completely makes sense in the realm of technology and how unafraid younger people are at taking risks. And there are some lovely young adults with a lot of great things to say about YA literature. I hope you find this post informative and enjoyable. Definitely give all of these amazing booktubers a watch or two and let me know what you think! If you want more recommendations, just visit my channel to see everyone I subscribe to! Been pondering lots of bookish, bloggery type things the past few weeks. 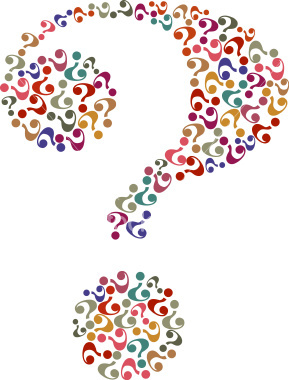 And since my readers and the interwebs tend to be a wealth of information, I’d appreciate any and all responses to my somewhat ridiculous questions below. 1. TUMBLR. What is it? I don’t understand the purpose it serves. I already have FB, Twitter, Blog, YouTube channel, and Instagram. What could TUMBLR offer me? 2. Book recommendations. I need them. Particularly contemporary fiction set in or written by an author from the Middle East, Africa, South America, or Eastern Europe. And nonfiction about anything. 3. I want business cards for my blog and don’t know how to go about getting awesome ones made. I know Etsy probably has something, but can any of y’all fabulous people recommend someone you’ve used? I have lots of other random things swirling around in my head. But those projects are rather large so I’d like to get a grasp on the new job and my working hours before I dive in. Thanks for any and all input! The biblical prophecy came true, or at least partly true. People disappeared, millions of them at the same time all over the world. This wasn’t some ancient rumor – a dead man coming back to life during the Roman Empire – or a dusty homegrown legend, Joseph Smith unearthing golden tablets in upstate New York, conversing with an angel. This was real. Perrotta is known for his satire. And he’s amazing at it. I previously read The Abstinence Teacher and was really yearning for more of Perrotta’s particular brand of satire. The Leftovers was even more enjoyable. But if you’re in this book looking for an in depth discussion of the ‘rapture’ – you’ll need to look elsewhere. The ‘rapture’ is only a catalyst for the actual story – a place for a seemingly normal suburban American family to lose themselves and begin the long struggle back to themselves. Or some version of themselves. Perotta’s language and story is straightforward and very pleasurable to read. The satire is obvious and yet subtle all at once. Sometimes his larger commentary sneaked up on me until he turned a very witty phrase and opened my eyes to the actual conversation he had been having with me the whole time. Well played, Tom. The family we’re following – the Garveys – aren’t even directly affected by the ‘rapture’. No family members go missing and yet all are deeply and complexly emotionally traumatized. Mom leaves her family behind to join a cult. Dad comes out of retirement to become city mayor. Son abandons college to follow around a charismatic, crazy prophet who is probably taking advantage of teenage girls looking to birth the new baby Jesus. And previously quiet, smart daughter turns wild, sexually promiscuous, and oddly observant of the underlying truth about her once normal family members. And then there’s Nora – unrelated but soon intricately linked to the Garveys. But unlike the Garveys, she has lost everyone. The Leftovers feels like a brief journey with these people on their way past the initial shock and healing following such a traumatic event. The ending doesn’t wrap up neatly, and we’re hardly sure whether anyone truly has a happy ending. Hell, some of the characters are left with pretty much no ending at all. We just abandon ship as they continue on their respective paths. I liked that uncertainty while other readers have bemoaned the unfinished conclusion. But life is like that. Life doesn’t have tidy endings and happily ever afters – not really. Perrotta’s story is definitely about the journey and not the destination. He has a lot to say about society and how tragedy affects us. Particularly the role of religion and family – human connection and fellowship. Highly recommended! I hope everyone has the day off to relax and extend all their weekend fun. I’m having a fabulous time celebrating the fact that I got a new job!! I’ve been interviewing with this company for a month now. Over the past few weeks, I met with four people and endured three rounds of interviews. BUT it was so worth it in the end! I loved everyone I met and I’ll be an internal auditor which is a job I’ve always been interested in. Plus, the benefits are amazing. 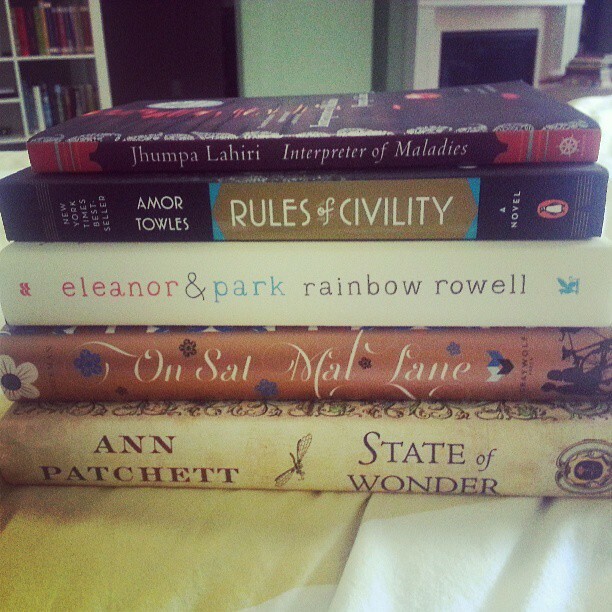 So I went way overboard and purchased all the books in celebration. The picture to the left is just one of the celebratory hauls. Been reading a ton! 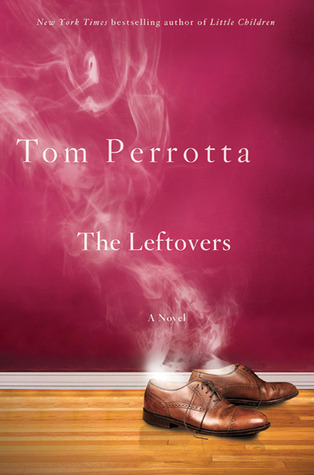 Look for reviews of The Leftovers by Tom Perrotta and Scarlet by Marissa Meyer this week. I just started Lionel Shriver’s new one, Big Brother. It’s my first Shriver and I’m finding a dictionary an essential reading buddy. Next up will be Much Ado About Nothing in time for the Joss Whedon film! Joss Whedon might be my hero. Short and sweet today! Have a great holiday and a fabulous week! Let’s improve the home, shall we? I love home projects and we’ve undertaken some minor things in the past few months – mainly just buying some furniture. Y’all might remember that we finally purchased ourselves a decent king size bed, new bedding, and stuff last summer/fall but I don’t think y’all have seen them all set up yet. I also finally got around to deciding on a new nightstand. A bookshelf. What else? Also, please excuse the poor picture quality brought to you by my phone. 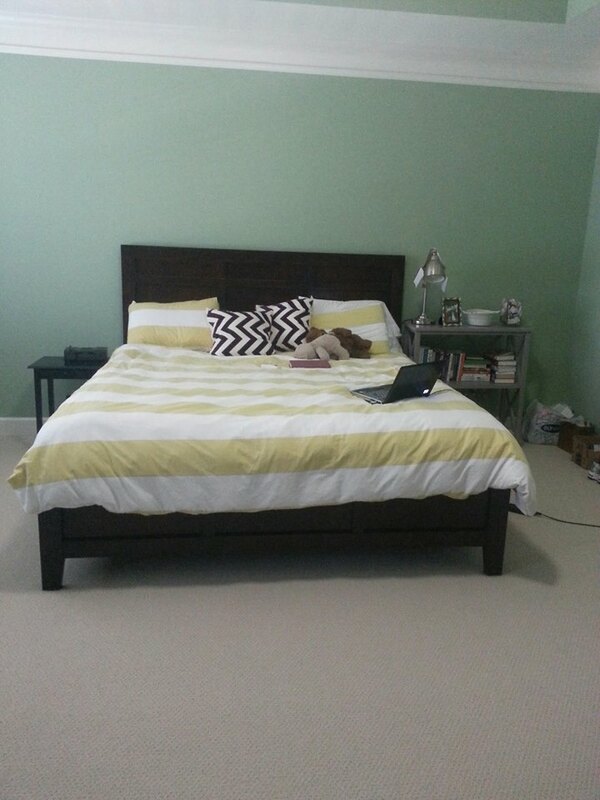 Once the room is done, we’ll take fancy pants pictures where you can tell the walls are actually a very pretty green. The bedding (which I love) is West Elm which we got on sale. The bed is Basset Furniture which we also found on sale! 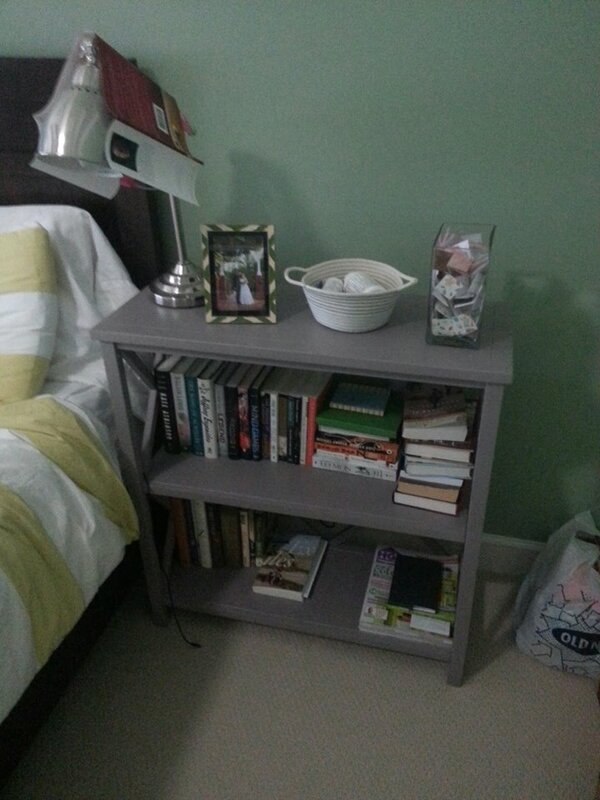 The bookshelf was purchased via Joss & Main which is an online furniture outlet. Lots of great deals and no problems ordering things online. The bookshelf was supposed to be a gray but ended up a light purple/lavender color which actually worked out much better with the yellows, greens, and purple chevron pillows. Those pillows – a steal from HomeGoods! My husband’s nightstand is a hand-me-down IKEA find. So…free! It belongs in the guest room, but he’s temporarily using until I decided (I guess, we decide) what sort of table will find a permanent home there. He only uses a bedside table for his clock alarm and to hold his cell phone. I’m thinking a small dresser to add some storage. I like using furniture pieces in ways that aren’t traditional. Notice the Old Navy bag beside my shelves – that’s trash. I’m just lazy enough not to remove it from the picture frame. Obviously we have more things to do in this section. Wall art and curtains for the windows are our next big bedroom project. I’d eventually love hardwoods upstairs, but money is a thing. I’d also like a chaise, settee, or bench at the foot of the bed. Maybe a cute smallish chair in the corner? Who knows. That huge fan (and it is GINORMOUS) will be going on the wall in a home built frame. I think it’s a gorgeous and interesting art piece for the barest of bare walls. The wall itself is a deep chocolate brown color. 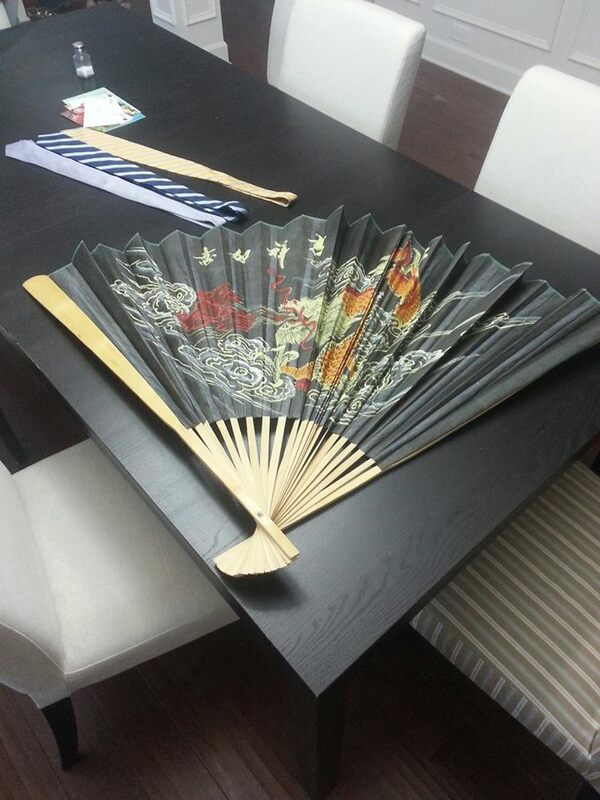 We bought the fan for about $20 at the Chinatown Mall down the street from us during Chinese New Years. I definitely want to bring some of the Chinese culture into the house since that’s Jimmy’s heritage. We’re going for a young, colorful, Southern US/Asian mix. Should be tons of fun. Now before y’all think I’ve been controlling all the decorating and purchasing – think again! Jimmy is spearheading the garden! He’s super excited and has been planning for weeks. Yesterday, while I was at book club, he and a friend went plant shopping. Tonight they are going to be doing the installation. In the flowerbed above they’ve gone with double knockout roses and calla lilies. I love that he chose the lilies cause those were my bridal bouquet! 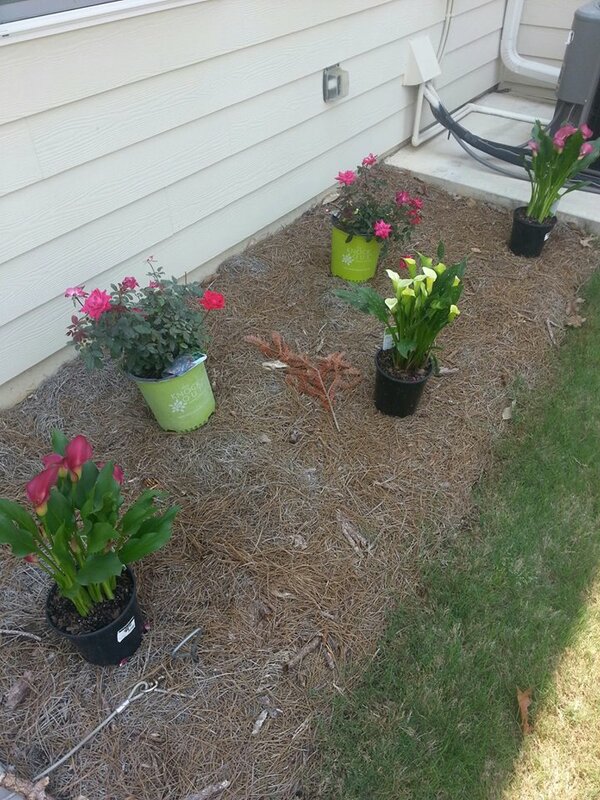 For the front yard, he purchased some purple and white flowers and a gardenia bush. They don’t look like much yet so I skipped taking their picture. Just imagine. Lots more on the agenda! One of the biggest projects we’d like to tackle is our entertaining area out back. We are a townhouse so don’t have a huge yard. In addition to the new flowers, we’re thinking about a porch swing to hang under our second floor deck and a fire pit/coffee table combo with some chairs and small tables thrown around. We already have a grill – so that’s a plus. We host a lot of people throughout the year and so this is a priority for us. What projects have y’all been tackling around the house this spring? [T]he child must have a valuable thing which is called imagination. The child must have a secret world in which live things that never were. It is necessary that she believe. She must start out by believing in things not of this world. Then when the world becomes too ugly for living in, the child can reach back and live in her imagination. The Litwits met yesterday to discuss A Tree Grows in Brooklyn by Betty Smith. For the first time in a long time, we universally loved this story. Since we all know writing about books we love is harder than those we hate, this post is going to be atrocious. Francie is my new favorite heroine of all time. Her sad moments are filled with joy, her happy moments sobered by sorrow. She’s independent, smart, and dreamily lonely. Her story is both tragic and uplifting. 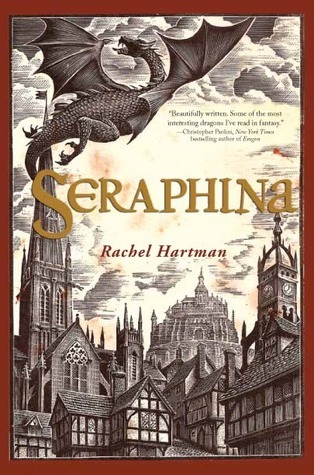 I wanted to crawl inside this novel and live there forever. Francie’s story is rather simple – she’s growing up in the tenements of Brooklyn circa 1901-1919. Her family has no money and does whatever’s needed to get by. Papa Nolan sings for his supper, literally, but doesn’t contribute much stability or financial success to his family’s needs. He’s a drunk with a heart of gold. Odd sentence, that. He loves his children dearly – especially Francie, but doesn’t love himself enough to rise above his struggles and survive. Mama Nolan is described as being made of steel. She shoulders the weight of supporting her family by scrubbing the floors of the buildings in Brooklyn. She can be cold and off-putting, but she never loses the loyalty or essence of motherhood. Neely is the coddled brother Francie loves dearly. They had such a beautiful sibling relationship. Much of Francie’s story is Betty Smith’s as well. She definitely wrote what she knew. Oh, the novel. I dashed if off at odd moments. It doesn’t take long to write things of which you know nothing. When you write of actual things, it takes longer, because you have to live them first. Emily described Smith’s writing as concise and immersive without being flowery or overdone. I wholeheartedly agree. Her prose is simple, honest, and lingers in sentimentality only at the most appropriate moments. The pacing was perfect and my time spent with this book was never a burden. My only complaint was that there wasn’t more of Francie. I wanted to continue on with her to college and beyond. The shear optimism this book exudes in the face of destitution and poverty won me over. The ladies also loved Smith’s sense of place. Brooklyn comes alive as does the early 20th century. 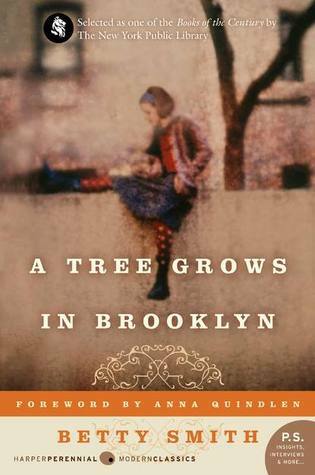 With A Tree Grows in Brooklyn you get to live a time not experienced first hand. I love books that bring to life something I’ll never be able to experience – unless they invent time travel before I die (it could happen! ).Women’s rights were becoming a thing and I liked seeing how the American society was reacting to the stronger feminine presence. I could totally keep going. But I’ll spare y’all. If you haven’t, go read Smith’s most popular and acclaimed novel. You’ll be left wishing you had read slower and adding Smith’s other works to your TBR shelves.